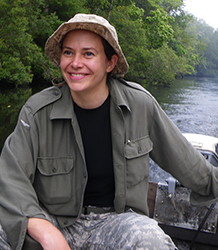 Ivy Owens is a geoarchaeologist and soil micromorphologist whose work spans 12,000 years, two continents, and prehistoric landscapes from semi-arid to submerged. She has worked in Kazakhstan, pursuing the first horsemen, or rather, the first currently known compelling evidence of equine domestication, since 2006. In recent years, this has been balanced by the adaptation of soil micromorphology to underwater prehistoric archaeology in pursuit of the earliest Americans in the southeastern United States. Problem solving, methodological improvement, and technological adaptation have always driven her work. While in Exeter she has assisted in teaching geophysics and forensic archaeology field practicals, and trained Exeter, Cambridge, and Kazakh students during field work in Kazakhstan. Before that, she taught as a laboratory demonstrator in geochemistry at the Department of Geography in Cambridge, and worked as a research assistant at Harvard. Recently she was attached to Texas A&M University as a scientific diver-in-training. Previous experience in the private sector includes working as a supervising archaeologist for an international geophysics company, and working for two of the larger cultural resource management firms in the American southwest and northeast. She has co-authored and edited funding applications to NERC, Leverhulme, MRC, and ERC across several scientific disciplines, including archaeology. At Exeter, she has worked with Anthony Harding and Alan Outram in developing long-term archaeological research strategies and project logistics. She has co-authored academic articles with Alan Outram, Jessi Halligan, and Mike Waters, among others. She holds degrees in Anthropology and Archaeology from Harvard and Cambridge.